The partners move together, footfalls drumming precisely to the lively swing of “Mr. Pinstripe Suit.” Despite the complicated choreography, they bound with an easy freedom only achieved through years of rigorous rehearsal. This deceptive effortlessness lies at the heart of dressage, a popular equestrian sport. Often described as dancing on horseback, the sport — first created for cavalry drills — challenges the relationship between horse and rider. The equestrian, using as few cues as possible, must guide the animal through a series of complex movements, sometimes set to music. To succeed, the partners must be perfectly in sync, both mentally and physically. Eleanor Brimmer, a 27-year-old equestrian who excels at the highest levels of U.S. national para-dressage, has searched relentlessly for the perfect fit in both sport and horse. She had the chance to compete on the 2016 Paralympic team, although she decided against showing at the qualifying trials when her new partner sustained an injury. Brimmer was born to a family of horse people. Her grandfather, an Irish immigrant, exercised horses for foxhunts in Virginia. A few decades later, Brimmer grew up on her family’s horse farm in Minnesota. At first, she rode in hunter jumper competitions, an equestrian sport where the rider jumps their horse over a series of obstacles. But after spending countless hours training and showing for Randolph Macon Woman’s College’s highly competitive riding program, Brimmer switched from jumping to dressage at the age of 22. Aside from permitting additional aids, para-dressage differs little from the centuries-old sport. Originally, dressage dates back to ancient Greece, where riders developed complex training maneuvers to prepare their warhorses for battle. In modern times, the rider guides the horse through a series of complex, dance-like maneuvers built around the animal’s natural movements. In freestyle competitions, the performance is set to music that matches the horse’s rhythm. 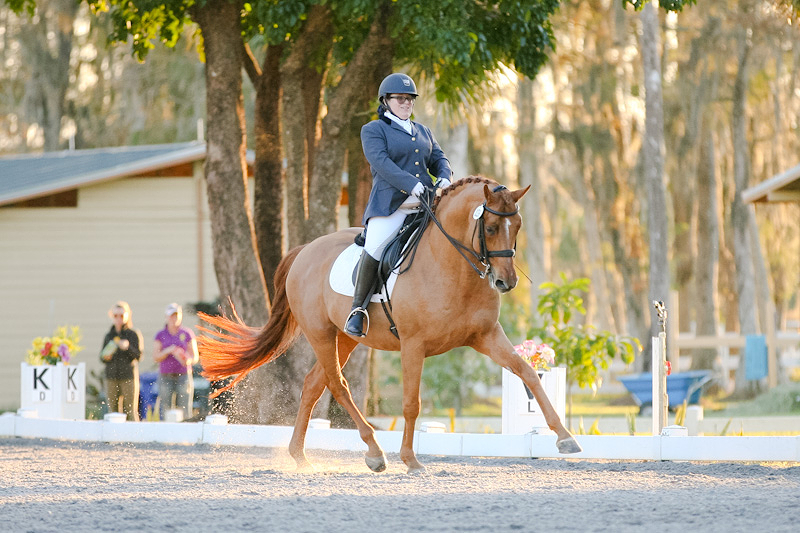 Judges score the routine based on factors like freedom of movement, the horse’s attentiveness, and the rider’s position on a scale of one to ten. As the ultimate test of the duo’s teamwork, dressage should appear effortless — like ballet dancers, they conceal their hard work and athleticism behind artistry. 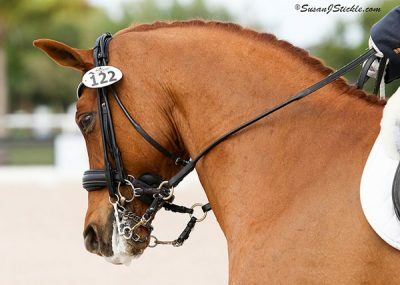 To accommodate the individual needs of participants, para-dressage allows more obvious aids than dressage rules usually permit. To keep judging standardized, riders receive a classification profile based upon their ability, strength, and coordination. Participants with similar profiles compete in the same group. Grade I generally includes riders who are fully wheelchair-bound, with all four limbs affected in some manner. On the other end of the spectrum, Grade IV includes riders with only one affected limb or impaired vision. Each of the five grades (Ia, Ib, II, III and IV) permits different types of aids and equipment for the competitors to use. “What surprises a lot of people is that Grade IV, like multiple sclerosis or a single disabled limb, is considered less disabled than someone like me with cerebral palsy,” says Brimmer who competes in Grade III. “The system is based on how our disability affects riding. I have multiple limbs affected, so I might have a more difficult time than someone with only one limb impaired.” In the Paralympics, each country must have four para-equestrian riders, with at least one in Grade Ia, though teams cannot have multiple athletes in the same grade. Although Brimmer began competing on a national level just two years after her initial foray into para-dressage, she struggled to find a horse that clicked. After trying out seven potential horses on a trip to Europe, Brimmer finally found the right fit — a handsome chestnut named London Swing, whom she flew home to Florida. There, she trained him in para-dressage, and affectionately nicknamed him Louie. Before working with Brimmer, Louie had little showing experience, but he made up for it with his easy and eager personality. “He knows he’s on display and he’ll put on a performance and prance around. You think of these high-strung horses but he takes everything in stride,” says Chelsey Michelsen, a fellow equestrian and close friend of Brimmer’s since their college years. In a stroke of poor timing though, Louie injured a ligament in his left hind leg shortly before the qualifying trials for the U.S. Paralympic team in Michigan, so Brimmer pulled out of the contest. Although her average scores met the requirement for participation in the qualifying rounds, she feared the long trip up from Florida would exacerbate Louie’s injury, and decided to give up her shot at international competition. Shira Polan graduated from Cornell University in 2015 with a B.S. in animal science and a minor in communication. She was a staff writer for the Cornell Daily Sun science section, covering topics ranging from tiger beetles to red algae invasions to gluten intolerance. When not running, singing, horseback riding, or training in karate, Shira can be found rehearsing for her numerous theatrical performances in the copious amount of free time left to her.